It a takes a serious 911 enthusiast to own a car like this - one that harkens back to car's earliest design. This is the 911 in its rawest form, luxuriously tailored and performance-tuned for summertime driving near the mountains and canyons of Boulder, Colorado. 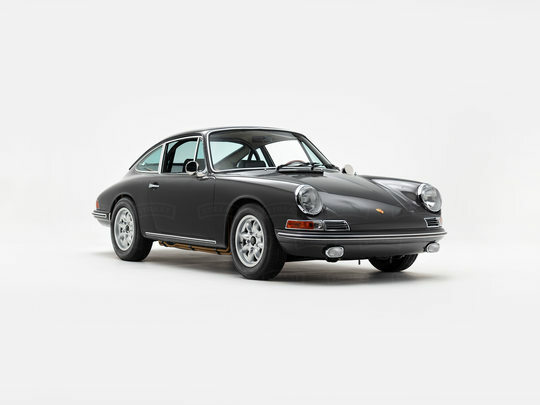 1968 was the last model year for the short-wheelbase 911’s - an iconic silhouette shaped by the passion to create the perfect sports car. It arrives painted in its original shade of Slate Gray with polished aluminum accents and a vintage Durant exterior mirror. Our client opted for two sets of wheels - a period-correct set of 15”x5.5” steel wheels for the concours and a set of 15”x6” Minilites for spirited everyday driving. Driving a classic 911 is an experience like no other — one that's fueled by the sound of the flat-six engine and an unparalleled connection to the road. And here, a series of carefully chosen upgrades make that experience all the more otherworldly. The engine was rebuilt to 2.2-liter specifications, and all systems were completely revamped and revitalized, including the transmission, exhaust, suspension, and steering. Now, finding new roads for the 911 will become the ultimate pursuit. Like all early 911’s this one is an exercise in simplicity. The cockpit has been wrapped in black leather and luxurious vintage-style carpeting. The A/C and original sound system were replaced with modern counterparts that complement the original design. Behind the wheel, all gauges and controls are refurbished and fully operational, leaving no doubt that the legend is back. Whether you want a classic 911 for the street or the track, the concours, or a weekend retreat, our team is here to help! Check out our builder or contact us, and let's get your project started. One of 473 1968 911 models sold in the U.S.